Cheap Metal Detectors - Metal Detecting on a Low Budget! How to bag yourself a GOOD cheap metal detector without buying a knock-off toy! Its a question I get asked at least once a week, where can I buy a cheap metal detector? Now I really despise the word cheap. When I think of cheap metal detectors I think of Chinese manufactured fakes or metal detectors that just aren’t going to work. Remember when you’re ready to buy your first metal detector, you buy cheap, you buy twice! I’d hate to recommend a “cheap metal detector” instead I’d like to recommend a low budget metal detector and how to buy a metal detector cheap. Many people would love to start metal detecting only to find their budget won’t allow them to buy a metal detector. So they go looking for the cheapest metal detector eBay or Amazon has to offer. It’s a huge mistake and if you want to enjoy the hobby and actually make some great finds then read this article first. This is why I am writing this article. I want to teach you how you can get started metal detecting with a low budget. I want you to enjoy your metal detecting experience and I want for you to be able to actually get a good metal detector all the while keeping within your budget. On this page, you will find cheap metal detectors, but every single one of them works and has good reviews. There are many ways of getting a good cheap metal detector, the main one is buying a used metal detector. Unfortunately, you’re not going to be able to pick something up for a few quid, it’s not going to work regardless of the claims. If you’re totally skint, which is understandable in today’s economic climate and I empathise, then try to be patient. Save a little extra to put towards your budget, maybe do a car boot sale, sell some old clothes or other things just lying around, you’ll be amazed at what people will buy second hand. It will honestly be worth the extra patience. Not only am I going to recommend good affordable metal detectors but I’m going to list a few accessories too to help you enjoy this wonderful hobby as much as you can. 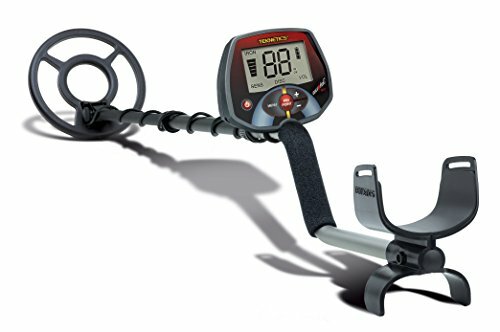 How to buy a cheap metal detector? To be honest with you if you want the most bang for your buck then I would opt for a used machine. Many people buy metal detectors then realise how hard it is to get permission afterwards and ultimately end up selling their machine on eBay, Gumtree or Facebook. Often taking a substantial loss on what they spent with barely any use to the metal detector. You’re going to want to stick to reputable brands. Garrett, Minelab, Fisher, Bounty Hunter, CSCOPE, Makro, Nokta to name just a few. Stay away from brands that aren’t known in the metal detecting world. These are often just toys. Set yourself a budget and be Patient. You might just be surprised at what you can get for your money by buying a second-hand metal detector. 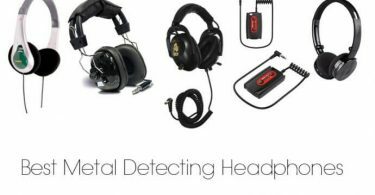 Another good tip is to look for metal detectors that still have some of their warranty left this adds extra security when purchasing a used metal detector. This is by far the best way to get a really good cheap metal detector. I started with the best metal detector under 100 as a heading but then realised that I couldn’t possibly recommend anything under 100 and be happy to do so. That being said the Garrett ACE 150 can be bought used for that kind of money. 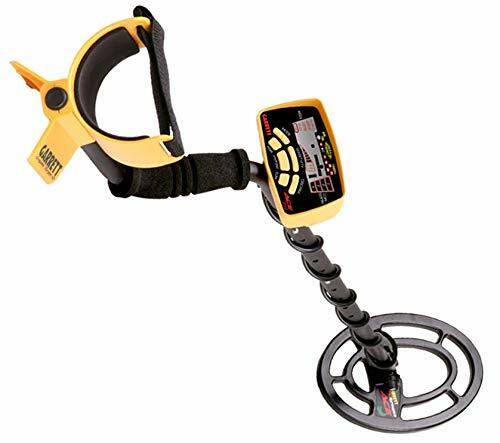 This is the only metal detector (new price) that I would recommend under 150. Obviously, you can get better machines used for this kind of budget. This is the best cheapest metal detector in my opinion. The Garrett ACE 150 was the first machine I ever used, a friend of mine lent me it for the day while he took me metal detecting. It was ultimately the metal detector that got me hooked! It’s worth noting that now in 2018 Garrett have released a new line of ACE machines and the 150’s up to date counterpart is the ACE 200i. It’s slightly more expensive but for the extra £25 – £35 if your budget will allow it, you’re going to get a slightly better machine. However, it’s not under 150 so I’m not going to write about it in detail here. 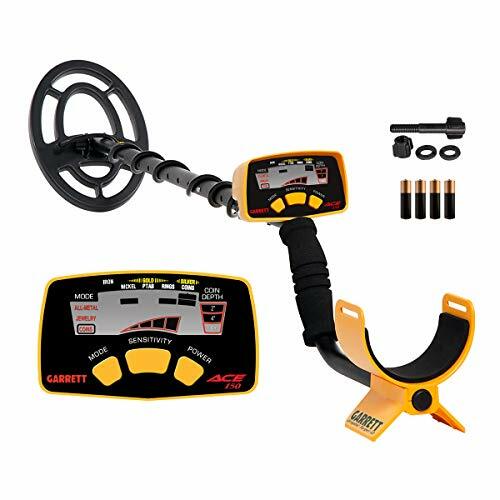 The Garrett ACE 150 metal detector is so simple to use, its switch on and go technology. You press the power button and that’s it you’re off! Obviously, you can change the settings but I just wanted to express how easy this metal detector is. There are preset search modes built into the Garrett ACE 150 which discriminate against iron and other trash metals. You’ve got all-metal which does not discriminate against any types of metal, coins & jewellery which discriminate against iron and other junk. The LCD display lets you know an estimate of the depth of the target you have discovered, what metal type it could be, the sensitivity you have the machine set to (yes you can change sensitivity) and the mode you have selected. It’s a cheap metal detector, but it does work! I found lots of coins and artefacts that day with the Garrett ACE 150 and I know for a fact others have too. To prove a point here’s a newspaper article about someone who found a very valuable hoard with the Garrett ACE 150. In a nutshell, it’s a very basic machine manufactured by a reputable brand that works. No frills. For the higher end of that price range, you should be expecting a barely used machine or a few extras that go with it. Making this metal detector one of the cheapest metal detectors you can buy. Well, one that actually works anyway. Unfortunately for this kind of money, you’re going to find it near impossible to get a metal detector that works well on wet sand, so if the beach is where you’re planning to go, don’t expect the Garrett ACE 150 to perform too well. Don’t get me wrong you will be ok in the dry sand but the moment you’re near the wet sand she’s gonna become unstable and give a lot of false signals off. Just worth noting you can get a second hand Garrett ACE 200i for around the same price. Once you get above the 150 budget mark it opens up numerous other options, options that give more power, better features and better performance. Especially if you’ve got between £150 – £200 and you don’t mind buying a used metal detector. Here are a few affordable metal detectors in this range. I believe the Teknetics EuroTek Pro is worth twice it’s price tag if not more. For more this is one of my favourite metal detectors. Regardless of how cheap it is. The Teknetics EuroTek Pro is packed full of features and technology that you really wouldn’t expect on a machine in this price range. It’s relatively simple to work out and to navigate the menu, after just a couple of hours using this machine you’re gonna have it figured out. I have this metal detector as my backup detector and let me tell you now I wouldn’t sell….EVER. It’s an absolute hidden gem and highly underrated. The standard coil that comes with it is not the best and I have to admit mine is upgraded which is a huge factor in the performance and why I love it so much. If you don’t mind buying second hand then you should be able to get the EuroTek with an upgraded coil and still keep under £200. I’ve dropped a link below where you can view the full list of features and modes of the Teknetics EuroTek Pro, along with an in-depth review! To buy a EuroTek Pro second-hand you’re going to be paying around £130 – £200. If you’re paying the higher end look for a Teknetics EuroTek pro that has a Double D coil, preferable a Nel Tornado. As simple to use as I explained about the ACE 150, you pretty much switch it on and go. It has been selling well for absolutely years now and is always reviewed well. Combining value for money with good performance the Garrett ACE 250 is a low-cost metal detector that works. Opposed to the 150 the Garrett ACE 250 has the addition of features like pinpoint mode, relics mode and a custom mode, which allows you to customise the setup. It’s slightly more powerful and will achieve slightly more depth than the 150. It has everything the ACE 150 has and more. Again not so good on the beach, it will become unstable on the wet sand. The Garrett ACE 250 has earnt its reputation in the budget metal detector range. For slightly more though you can get the Garrett ACE 300i which will take you a tad above the 200 budget, worth it if you can afford it. The LCD display has depth indication, metal type indication, notch discrimination, battery level indicator, the mode you have selected and sensitivity levels. With many positive reviews, if you’re looking for something cheap then the ACE 250 is another recommended detector. PRO TIP: Go for the higher end of the budget, you should expect to get an upgraded coil or extra accessories. Minelabs GoFind 40 is a highly portable machine it folds down nice, flat and compact and can be put in a backpack! Minelab is another huge name in the metal detecting hobby creating some of the best metal detectors in the world. With the Go-Find metal detectors, they’ve obviously wanted to give producing entry-level, budget metal detectors a shot. Something they hadn’t previously bothered with other than the X-Terra 305. 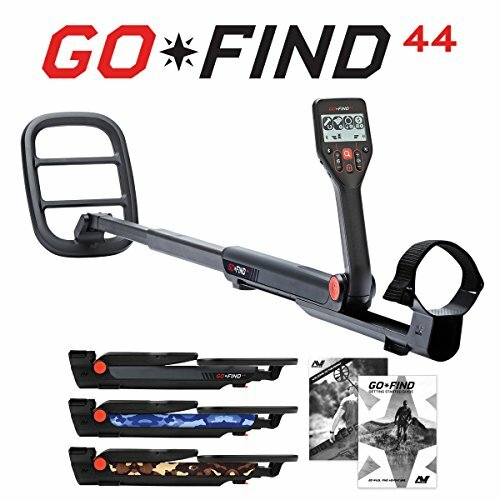 There are 3 Go-Find metal detectors the 20, 40 and the 60 and today I will be recommending the GoFind 40. They got a bit of stick when they were first released, perhaps because people were judging them by Minelabs usual standard of a metal detector. As a cheap entry level metal detector, the Minelab GoFind 40 is capable machine, it’s a tiny bit less powerful than the ACE 250 depth wise according to tests found on the internet, but, it does have a few features that the ACE 250 doesn’t and it is a little bit more stable on the beach in wet sand. Unfortunately still not the best though. The LCD screen is backlit for dim conditions, it has built-in *Bluetooth which can sync to your phone via an app, preset search modes making it incredibly easy to just switch on and go, pinpoint mode and graphic target ID. *The Bluetooth phone app has a bunch of features like allowing you to geo plot your find-points, listen to music, real-time detector display and has full metal detector control. Out of all the previously mentioned detectors, this is the most modern, it looks it as well but that being said its probably the most criticised. I had a go on a friends, who said he was impressed, I thought it was good. Not brilliant but good. It works and it does discriminate relatively well. So if you want something that looks good, works well and is still fairly cheap the Minelab GoFind 40 is a metal detector that gives you a broad amount of features for your budget. I won’t go on for too much longer I promise. What I want you to have learnt from this article is mainly not to buy a cheap fake, or no-brand metal detector. You have to stick to the brands if you don’t want to be disappointed and potentially lose your money. If you have to, be patient and save just a little bit more. There’s plenty of things you can do while you wait, try to get some land permissions or read through some metal detecting beginners guides. That being said all of the cheap metal detectors that have been mentioned in this article work. Some better than others, but they all work and all have a good reputation. They all come with a manufacturer warranty and they all will keep you going until you can afford an upgrade. Trust me once you’re hooked you will want to upgrade! I hope this guide has been of some help to you and you find a metal detector that suits your low budget. A Pinpointer is a bit of a luxury in the metal detecting world, but believe me when I say they are a fantastic investment. Often or not to buy one of the top pinpointers you’re going to be paying over 100. So I imagine if you are here you’re not going to want to spend this much on a pinpointer. There are good cheaper pinpointers out there that you maybe could afford. So here are a couple of good cheap pinpointers that actually work well….and if you buy them used you’re going to get them even cheaper! What about the minelab 60? Is it worse than the minelab 40? Hi Corina, Thanks for dropping by. There isn’t really much difference between the two in all honesty. There is 1 more set of audio tones and an extra mode on the Minelab Go 60. Oh and of course the price. Performance wise they aren’t too far apart. Apparently, the Go Find 60 goes a little deeper. You’ve then got the price difference. Hope this helps.